Our favorite Sunday drive is into the hills west of the base. In 45 minutes, we are parked and ready to hike up a gradual path to view the Hinohara Waterfalls. We’ve visited the falls in all seasons, and it is spectacular, plunging maybe 80 feet over a wooded cliff into a shallow pool. The waterfall is worth visiting for several reasons. We have taken dozens of photos; the most striking is when it is mostly frozen over in the coldest part of winter. We have also carried a lunch along to eat and watched visitors as they climb. The various levels of dress and skill are entertaining: men in unnecessary hiking gear, young ladies in high heels and miniskirts, mama-sans in their 80’s, and little kids just skipping along. We recommend you wear a comfortable pair of walking shoes. We found the path negotiable but muddy in the fall and slippery because of ice in the winter. As it is a shaded, rocky area, it tends to be cooler than the surrounding countryside, so dress warmly, too. We recommend you time a Sunday drive for the late morning so the sun is high for photographs and the traffic is not jammed up as you come back toward base (usually 3:00 to 5:30 pm). In the summertime, go in late afternoon and take a picnic supper to eat as you take in the view. During your hike back, keep an eye out for the face on the coffee shop’s wall. When you see the face, you will know that you are near the car park. In the fall and winter, reward yourself with a warm drink at the coffee shop, or maybe a cup of soup. The coffee shop also offers a variety of pottery, so you may end up taking home a unique gift. GPS Coordinates for the parking lot are 35.73004, 139.14119. 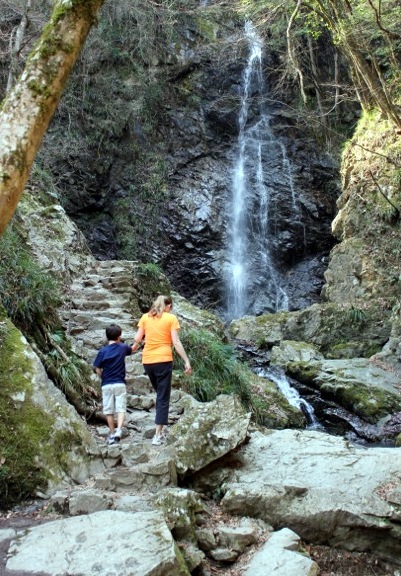 While visiting Hinohara Waterfalls, be sure to check out the Kanotoiwa Rock, a side trip worth taking. DIRECTIONS: Turn left out the Fussa Gate (0 km) and right at the first light. You are now on Tamabashi Dori, which changes to Itsukaichi-Kaido after you cross the Tama River Bridge (2 km). The road goes in a pretty straight line out to Itsukaichi, the first town in the hills (although it curves left after the bridge and merges right at 7 km). 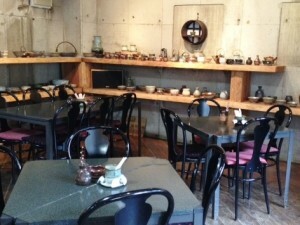 In the middle of Itsukaichi, you come to a “T” intersection in front of the train station (11.2 km). Turn left and continue on through the town. You will see signs showing Hinohara ahead. At the “Y” intersection (15 km), stay to the left. When you come to another “T” intersection at Motoshuku (19.9 km), turn right. In about a 1/2 km, just past a school crossing and opposite a bus turnaround (20.5 km), turn left up a hill just before crossing the first bridge. After going over a narrow bridge, you may park in a small parking area near a rustic coffee shop or continue further up the road to a larger parking area. (Note: the Okutama Nature Map calls this the Hossawanotaki waterfall.) From the lower car park, you will find the path to the waterfall after you walk back across the little bridge and go right. From the higher car park, follow the path that starts by the restrooms and meets the main path up to the waterfall. Once you pass the bathrooms and start heading down the hill you turn right on the very first little bridge path. Make sure you pass by the little ice cream store and you will know you are going the correct way. The easy hike will take maybe 15 minutes. If you want to hike more, a big map near the restroom shows many other options, or simply start walking up the road from the parking lot. There are forest trails on both sides. Rod & Cheryl Mees. Liz Ruskin updated 2010; photos Sandy Sax, Kelly O’Donnell & Michelle Nexon. This entry was posted in Daytrips, Sports & Outdoors, Summer, Top 5 Day Trips, WEST OF FUSSA: Akiruno, Akigawa & Itsukaichi. Bookmark the permalink. Thank you once again for giving inspiration and wonderful directions for day trips. We made it to Hinohara Waterfalls and back without any problem. They were beautiful! If anyone has directions to the many other falls listed for that area, please post. Finding them on our own proved futile, but we did enjoy exploring. Turn left out the Fussa Gate (0 km) and right at the first light. You are now on Tamabashi Dori, which changes to Itsukaichi-Kaido (Route 7) after you cross the Tama River Bridge (2 km). The road goes in a pretty straight line out to Itsukaichi, the first town in the hills (although it curves left after the bridge and merges right at 7 km). In the middle of Itsukaichi, you come to a “T” intersection in front of the train station (11.2 km). Turn left onto Route 33 and continue on through the town. You will see signs showing Hinohara ahead. At the “Y” intersection (15 km), stay to the left. When you come to another “T” intersection at Motoshuku (19.9 km), turn right onto Route 205. In about a 1/2 km, just past a school crossing and opposite a bus turnaround (20.5 km), turn left up a hill just before crossing the first bridge. After going over a narrow bridge, you may park in a small parking area near a rustic coffee shop or continue further up the road to a larger parking area. 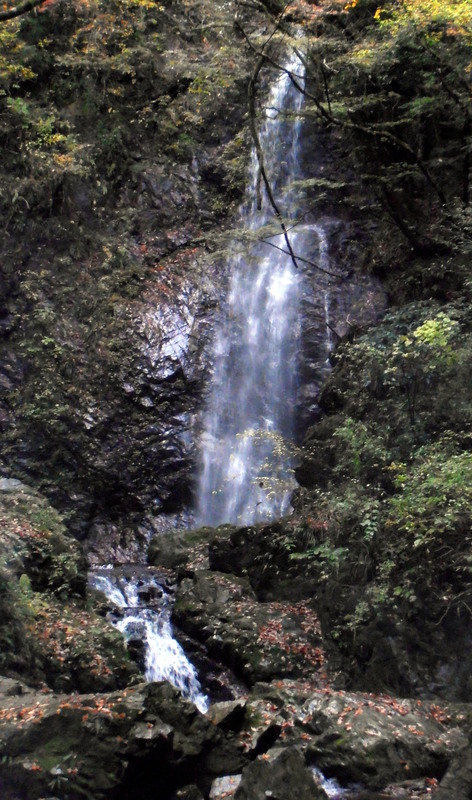 (Note: the Okutama Nature Map calls this the Hossawanotaki waterfall.) From the lower car park, you will find the path to the waterfall after you walk back across the little bridge and go right. From the higher car park, follow the path that starts by the restrooms and meets the main path up to the waterfall. The easy hike will take maybe 15 minutes. If you want more, the big map near the restrooms shows lots of other options, or just start walking up the road from the parking lot. There are forest trails on both sides. This was an amazing day trip and an excellent place to take family photos. Easy to get to, thanks to fantastic directions! Half way up to the waterfalls there is a little shop, very cute handmade wood items and postcards. Also, near the bottom is an eatery they have delicious ice cream. 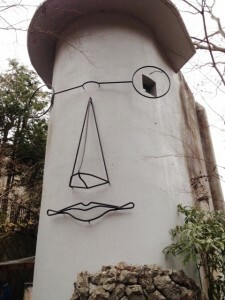 A must see while here in Japan. Directions to trail from top parking lot: Across the street from top parking lot will be a restroom and a large map follow that path down the hill at the bottom of the hill there will be a bridge that goes straight ahead (excellent place for family picture taking) or a trail that turns right, you must turn right at that point as that is the trail that leads to the waterfall, just follow it all the way up to the waterfalls. Beyond the parking lot: Be careful if you continue to drive up the mountain on the narrow road beyond the parking lot by the restrooms. It is only wide enough for one vehicle with very few spots to pull over or turn around. It has steep dropoffs to one side and tight turns throughout. There is a gravel pull out up the mountain that does provide an excellent view, but it will take another 15 minutes to get there. It is a pretty drive, but a little risky. Fabulous! The directions were ‘spot-on,’ and the kilometers really helped. We went up on a cloudy, drizzly day, and it was perfect. Hiking up there was so fun! It is so funny that you saw people wearing hiking gear, because that was one of the easiest hikes of my life. My 2 year old niece walked almost the whole thing. 🙂 I did not hear about Kanotoiwa rock while I was there, but checking out your other post, I really wish I did! It looks so fun!